This book challenges to design and control robots made entirely of electroactive polymer gels. They are deformable like mollusk that can locomote dynamically or manipulate things softly. Such a machine has been a dreamin the past but is now experimentally possible. 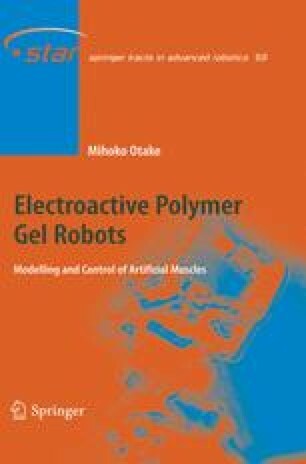 Gel robots are made from electroactive polymer gels. The purpose in creating these machines is to investigate fundamental principles in the design and control of machines comprising of soft and active materials. Ideas are being explored independent of material types, in the hope that the methodology being investigated will be applicable to other materials that may appear in the near future - material developments being an ever-ongoing field of discipline. The advances in electroactive polymers make it a highly attractive candidate for building of artificial muscles machines. The universal difficulty to embody deformable machines made from electroactive polymers has been organized into two parts. One originates in deformability of the machine, and the other derives from activeness of the material being applied. These problems were addressed in this book by utilizing computational models of materials that comprise the machines. Driving systems were explored extensively, designed based on their ability to eliminate difficulty of control. Methods to generate variety of objective shapes and motions are proposed by this research.